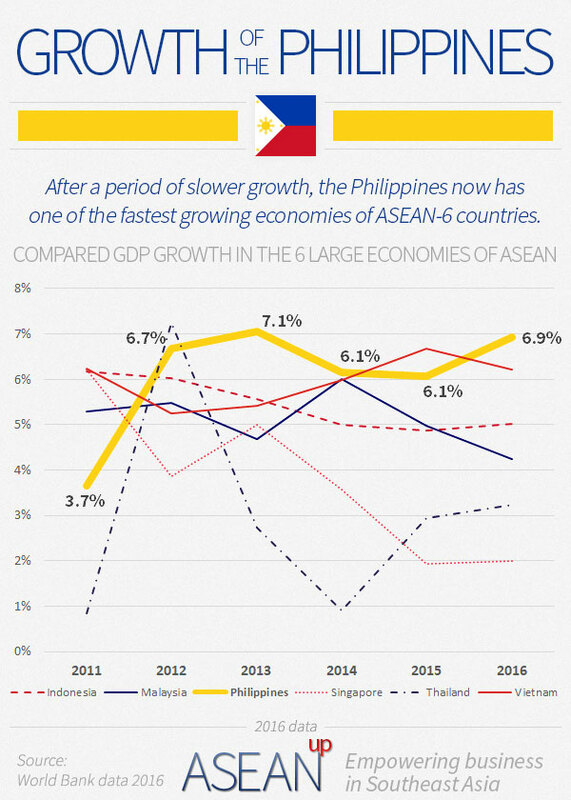 The second most populous country in Southeast Asia after Indonesia, the Philippines consistently has one of the fastest economic growth in the region and the world. With a high level of proficiency in English and a population eager to work abroad or with foreigners, the Philippines' economy is also rapidly advancing in global services and trade. 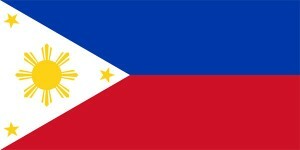 After decades of political difficulties and isolation, the Philippines has taken a turn for the better and undertaken a complete transformation of its politics and economy. Having capitalized on its population's proficiency with English language and overseas workers, and led by its largest companies, the Philippines has now become one of the world's most dynamic emerging market. In support of the economic environment, taxes in the Philippines are relatively low compared to the rest of the world, though not as low as other countries of Southeast Asia. The English proficiency of Filipinos has enabled the country to become a global leader for the Business Process Outsourcing - BPO - sector, even surpassing India. A key to the Philippines' economic growth, BPO brings large revenues and investments from abroad in the Philippines. Besides, to cope with the country's particular sensitivity to disasters and environmental issues, the Philippines has resolutely engaged towards sustainability. Profiting from its natural subterranean resource, the Philippines has notably become a global leader in geothermal energy. A relatively small industry, tourism is nonetheless on the rise thanks to smart ways to promote the Philippines, enabling a growing amount of visitors to explore Manila, Boracay or the Philippine UNESCO world heritage sites. 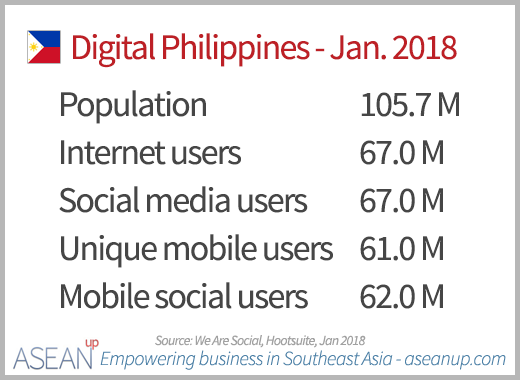 With the second largest population in Southeast Asia behind Indonesia, the Philippines has one of the most active population on social media. Its large digital community and penetration of mobile devices provide a new medium to revolutionize underdeveloped industries like financial services and overseas Filipino workers remittances through new FinTech startups. 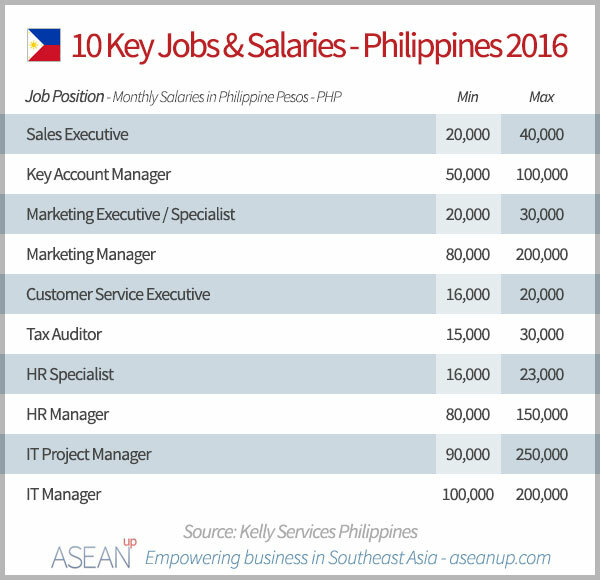 With its tropical climate and friendly population, the Philippines provides a great environment for foreigners willing to work in the country. Salaries are not as high as in other countries of the region, but the authorities are committed to not only improve the country's economy but also to develop more sustainable cities, especially in Manila. Though it is impacted by revenues from the Business Process Outsourcing sector, the Philippines' export rely a lot on commodities, but also on manufactures goods for the electronics, transport and garments sectors.